What do you get when you cross World of Warcraft's fiendish aquatic foes with the undisputed Lord of Terror? Behold Murkablo, the stuff of nightmares and BlizzCon 2011 goodie bags. Each year at Blizzard's annual fan celebration of all things related to it, the company likes to hand out special in-game murloc-related items to thank players for spending a couple hundred dollars to come see their stuff. In 2008 in was a bear being ridden by a murloc. 2009 featured a murloc crossed with a StarCraft 2 space marine. Last year saw the vengeance of the Deathwing murloc, and this year? This year is Diablo III's turn. I suppose every race must have their own Lord of Terror. 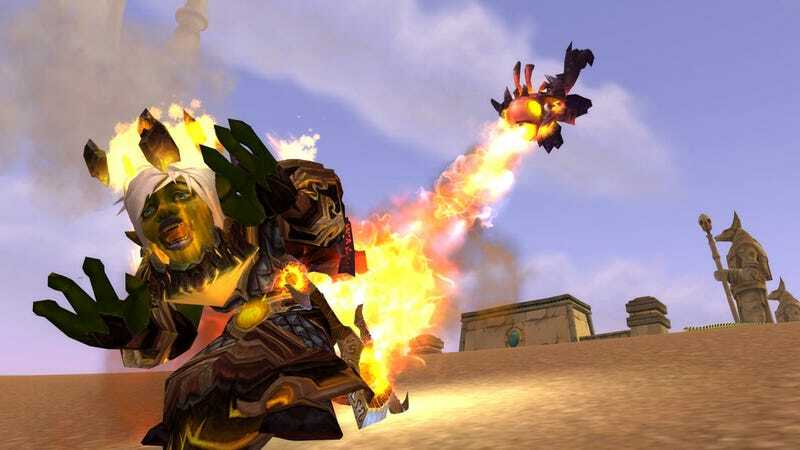 For World of Warcraft's fishy friends, that Lord of Terror is Murkablo, breathing fire on innocent Goblins wherever they may roam. Codes for Murkablo will be handed out to all BlizzCon attendees, as well as those that opt to stay home and watch it via the BlizzCon Virtual Ticket.